Funding for your aquatics club is available from an array of resources, some of which are covered here. The Region, in partnership with the County Associations, run a bursary scheme. Application forms need to be submitted to your County Association contact as detailed on the below application form. If you are actively working within a club network you may be eligible for funding from the South West Region. Two funding pots are available, see the below forms for more information. Please note, the Swimming Committee will not fund Diving, Open Water, Synchronised Swimming or Water Polo activities. For any queries on the funding available please contact the Regional Office. For other funding opportunities that may be available please see the Funding Guide put together by sports coach UK in partnership with England Coaching Network, Governing Bodies of Sport and the Home Country Sports Council. Each Swim England County Swimming Association also has funding available to clubs to support them – please click on the County you are interest in to be directed to their page. Sport England is the one the largest funders in the country. They provide a ‘Small Grants Scheme’ along with other themed rounds of funding which clubs can bid for based around delivering different objectives. More information can be found by clicking here. The County Sports Partnerships are networks of local agencies committed to working together to increase participation in sport and physical activity. To find your local County Sports Partnership click here. There isn't a 'one size fits all' package when approaching the topic of sponsorship. Clubs may seek sponsorship for various different events and projects, such as Team Kit, Equipment or Training Camps. Sport England provide a Sponsorship Toolkit through Club Matters; Swim England have produced their own Aquatic pack to be used as an extension to this. Throughout the document there are samples, guidance and templates which can help you develop a sponsorship proposal specifically for your club. A step by step guide to compiling a sponsorship proposal. Templates, samples and top tips for clubs. Examples of companies to try and approach. Links to additional documents and contacts. Along with the document you there are editable word document templates which can be downloaded and edited to suit your club. Sport England's guide to Club Matters can be found by clicking here. 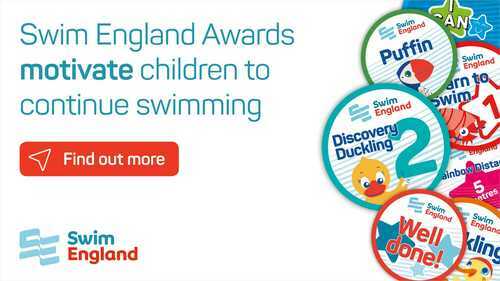 Did you know you that you can generate income for your club by selling Swim England Awards? Awards motivate children thus helping you to retain them within your club. Parents/ Guardians can see that their child is progressing. Clubs can generate income on each award sold. Clubs can use the Adam Peaty campaign to promote the awards. There are awards for all disciplines and all levels up to competition. SwimMark accredited clubs receive a 5% discount on award purchases. So is there a business case for selling awards? If your club has learn to swim and pre competitive squads then yes. The average profit for every award sold is £1. There is also the additional income generated by retaining swimmers within your club programme.